An often overlooked destination, Grenada is a gem in the Windward islands of the Caribbean, and one of the smallest independent countries in the western hemisphere. Grenada is covered in tall, postcard perfect lush green mountains that make much of the country’s landmass difficult for development. Combining this with miles upon miles of perfect sandy beaches and crystal clear Caribbean waters, Grenada offers one of the most pristine environments within the island chain. 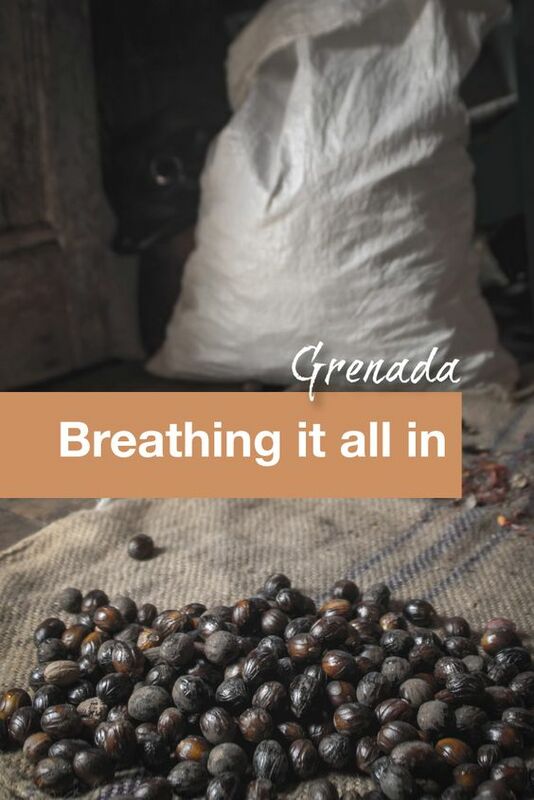 Grenada has a long history as a global supplier of spices such as nutmeg, cloves, cinnamon, and ginger. The country actually supplies about one-third of the global nutmeg supply and has more spices per square kilometre than any other place in the world. 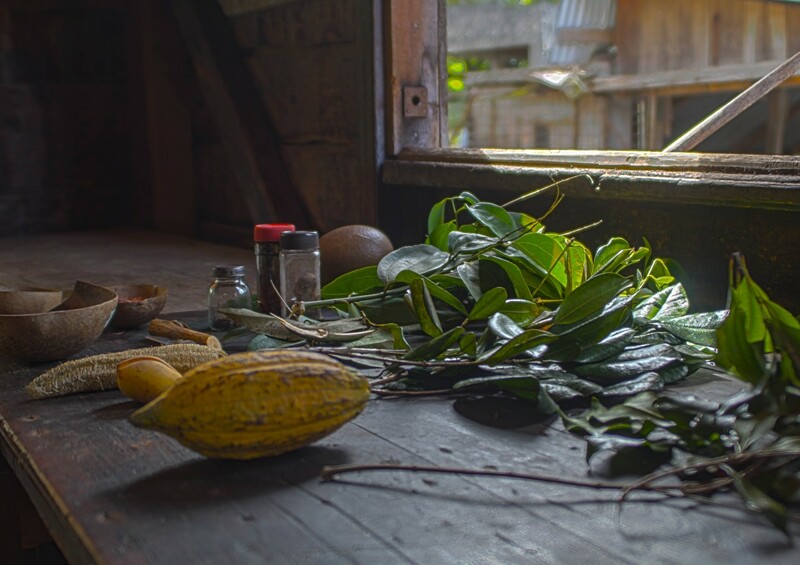 This unique industry has become part of Grenada’s push towards becoming a focus within the tourism industry and spice tours are now a popular activity among many visitors. The pre-eminent tour operator in Grenada is a man named Simon Seales who prefers to go by Mandoo of Mandoo Tours. Mandoo has a deep love for his country, and it seems that every person we came across on our tour knew him. Mandoo took great pride in caring for all the islanders and was even called on for some of his charity work while we were on tour. If you are looking for a tour operator who will cater to your every need and be ever-present, Mandoo might not be your man, but if you are truly interested in learning about Grenada from someone who seemingly knows everything about it’s people and it’s industries, I cannot recommend Mandoo enough! Mandoo picked us up in his comfortable tour van. Knowing that Grenada did not have car-seat regulations we brought our own car-seat from home and Mandoo helped me strap it in before taking off for our first stop, Annadale Falls. 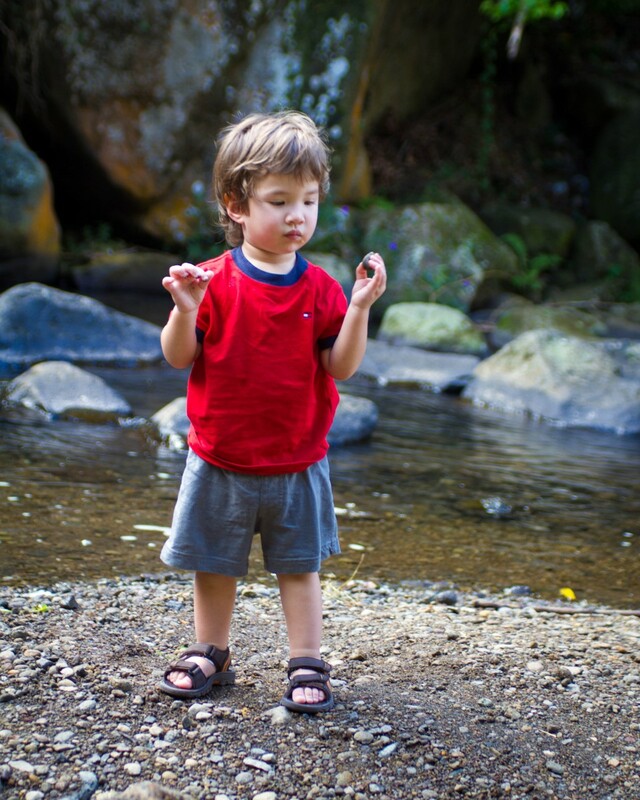 A short, 20-minute drive from St. Georges lies Annandale Falls. This small, picturesque waterfall is surrounded by a garden of green and walls of rocks covered in soft-leafed ferns. We were lucky enough to arrive when some local youths were jumping off the rock cliffs into the crisp clear water. One of these young men took time out from his fun to introduce C to his pet iguana. Annandale offers incredible beauty and the chance to stroll through some of the most beautiful rainforests you can find. If you have extra time, you can hike about 20 minutes to get to the 7 Sisters Falls, the hike is an easy one, but remember to bring water. The entrance to Annandale falls is through an interpretation centre at the edge of Constantine. Here you can find information about Grenada and its waterfalls as well as purchase snacks, drinks and souvenirs. About four kilometres north on Constantine at the tip of a steep and windy road we entered Grand Etang National Park. Grand Etang feels cut off from the rest of the world, kilometres of wilderness surround you in lush greenery and the clean smell of fresh, untainted nature surrounds you. Grand Etang offers a plethora of hiking trails and hosts the beautiful Grand Etang lake. The hike down to Seven Sisters Falls is considered the most beautiful hike in Grenada. 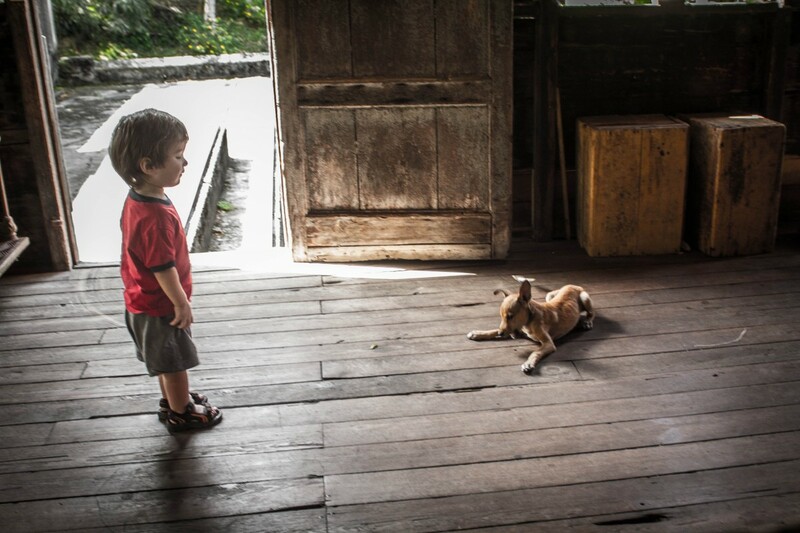 After some time spent exploring, Mandoo checked his watch and asked if we wanted to meet some monkeys. Considering my nickname for C was Monkeyface, I became incredibly excited. We were brought up to an empty parking lot and Mandoo had us stand near a railing looking out into a tree filled ravine while he went to the van and fetched a couple of bananas. 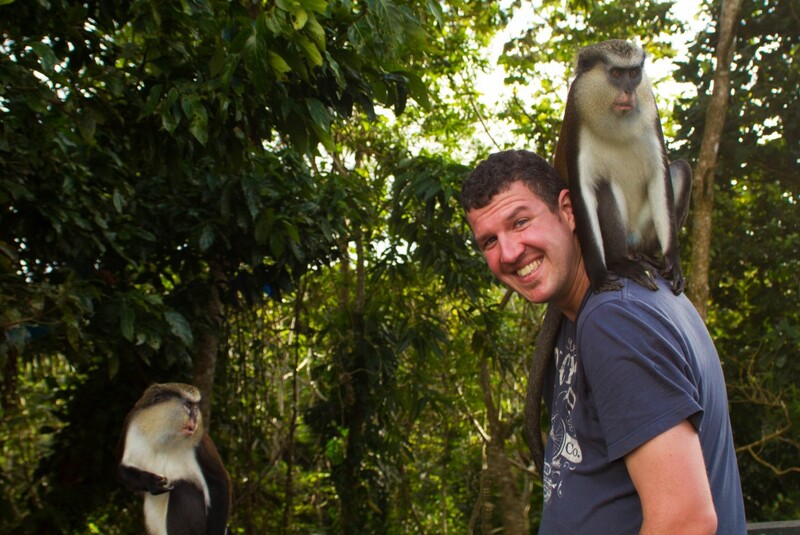 After only a few moments, we all let out a laugh as a family of Mona monkeys swung through the trees towards us. As I held a banana with one hand, and C with the other our encounter became closer than we could imagine as one of these adorable creatures hopped up onto Mandoo’s head, crossed over to sit on my shoulder and helped himself to the banana I was holding. Looking back, I was laughing too hard at the experience to even see how C was reacting, but judging from the photo, it looked like he might have experienced his first heart attack. Mandoo explained that these monkeys were brought over from Ghana in the 18th century. 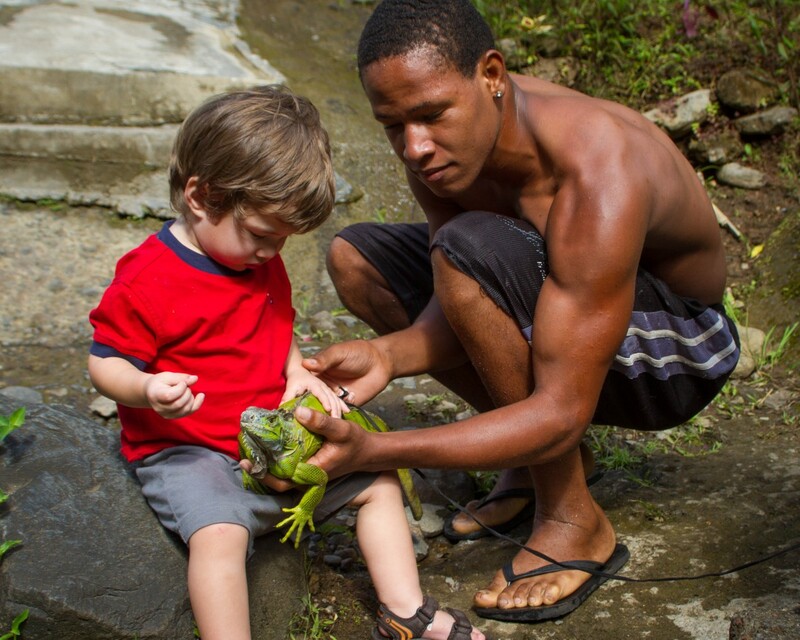 They were released into the wild and have flourished in Grenada’s food filled tropical jungle. The monkeys now number in the thousands and have integrated well with the island and its people. Located just outside of Gouyave near a grove of pimento trees lies the historic Dougladston Spice Estate. This spice factory is old and it feels that way. The place has seen better days but the rundown feel gave the estate a charm that made me immediately fall in love with it. They also still pick and process the spices the old-fashioned way, giving you an authentic look into what goes into all your favourite cooking scents. If you are a photographer, this place is a dream come true with incredible lighting and textures around each corner including a beat up old land rover lying in a barn. The workers at the plant took the time to explain all the different spices to us as well as show us the process in which they are prepared. They took a special liking to C, who lapped up the attention. He loved exploring the farm, meeting the dogs, who also decided they would follow him around for the whole visit, and enjoyed opening and closing the giant spice drying racks. Before you leave, make sure to purchase some of the local spices to bring home. They sell them at a very reasonable $5 a bag and you can mix and match as you’d like. Not far from Tivoli sits another location that time has forgotten. 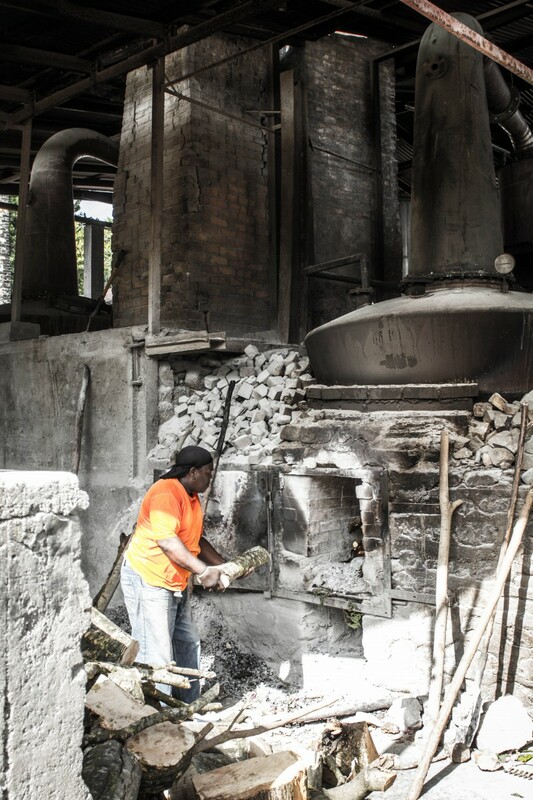 The River Antoine Distillery is Grenada’s oldest rum factory and it’s practices don’t seem to have changed since it’s inception in the 1700s. That’s right. 300 years and the rum is being made in the exact same way in the exact same buildings, possibly by the exact same people, but we couldn’t confirm that last point. Rickety wood carts are moved up old dirt paths to move the sugar cane to the plantation. The stone buildings that house the distillery are missing a good number of their walls and roofs and even the wood fire boiler has been with the distillery since the beginning. If that isn’t authentic enough, the whole process is powered by the original waterwheel fed by the River Antoine. All of this makes for one of the most incredible photo-ops you can ask for and you would think the rum would match that! Unfortunately no. The rum this place distills sits somewhere in the blinding territory and gives off a taste reminiscent of lighter fluid. But it will get you drunk. Really fast. 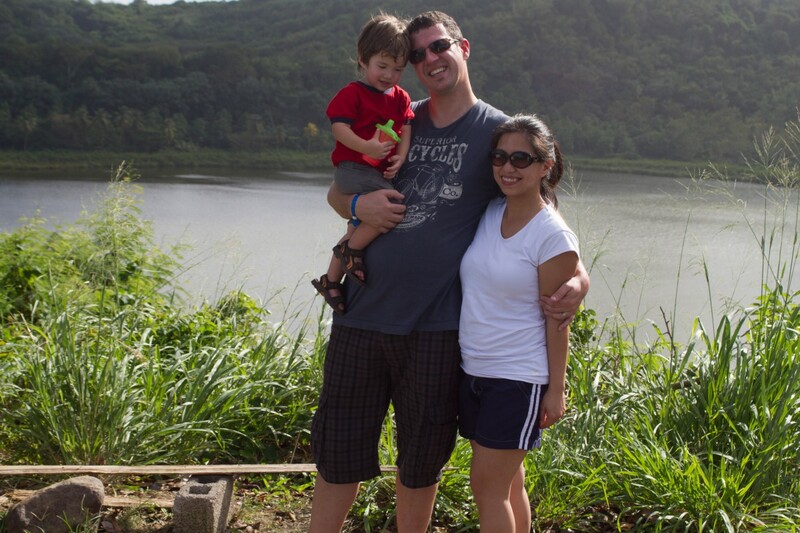 Not far from the distillery is the picturesque Lake Antoine, a shallow crater lake. The trails leading up to the lake offer some really neat ruins of houses that were destroyed by some of the hurricanes that have battered the island throughout the years. The lake has a beautiful hiking trail that snakes around the perimeter offering views of local wildlife like the snail kite, the fulvous whistling duck, and the large-billed seed-finch. Pearl Airport in Grenada isn’t much to look at from a distance. This place has long been decommissioned and it’s main role these days is as a grazing spot for the local cows and goats. Well in 1983, Pearl airport served as the service port for the Cuban military during the coup of Grenada’s parliament. The American military came onto the island in full force to overthrow the military-backed Socialist overthrowers and during the assault shot up and destroyed most of the islands military planes. The few that made it through without being completely destroyed now sit in this field and it is easy to wander the field and explore the wreckage of a bygone era. 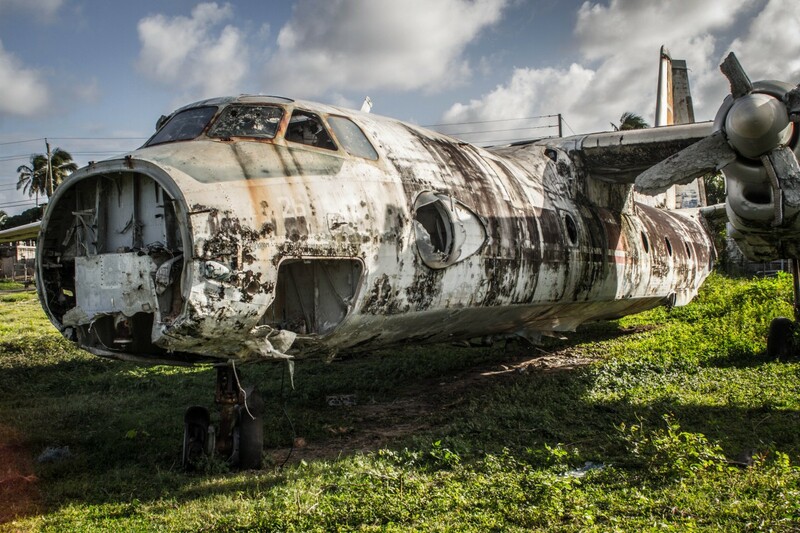 The planes sport obvious bullet holes and most of the insides have been torn out, but they make for a fascinating glimpse into a violent period in this otherwise peaceful island. Grenada really is more than meets the eye. Surprises lie around every corner and I highly suggest you visit while the tourism industry here is still young. The people are friendly, the water is beautiful and there is enough adventure to keep anyone busy. If you’ve been to Grenada and have stories to tell, we would love to hear from you. Leave us a message in the comments section below! Thanks Patricia! The islands really are incredible aren’t they? Thanks for the love on Monkeyface! Great post! I loved Grenada. It was beautiful, quiet and had some great things to see and do. I only wish I would have learned to scuba dive before going. I loved the plane boneyard too. I am lusting very hard for the Land Rover right now! Kevin, We are making a stop on Grenada on our cruise this next week! I will try and look up or contact your guide. Our cruise is through Disney, but I might be able to contact him and do a tour. We have a snorkeling cruise booked but it doesn’t last all day. It looks like you guys had a great time. Hi Elaine, Great to hear! You’ll love it! If you’re looking for a tour, you can’t beat Mandoo! With a half a day left though, you may want to take the time to wander around St. Georges and the fort as well. The bay in St. Georges is considered one of the most beautiful in the Caribbean! Ooh, now I want to visit. 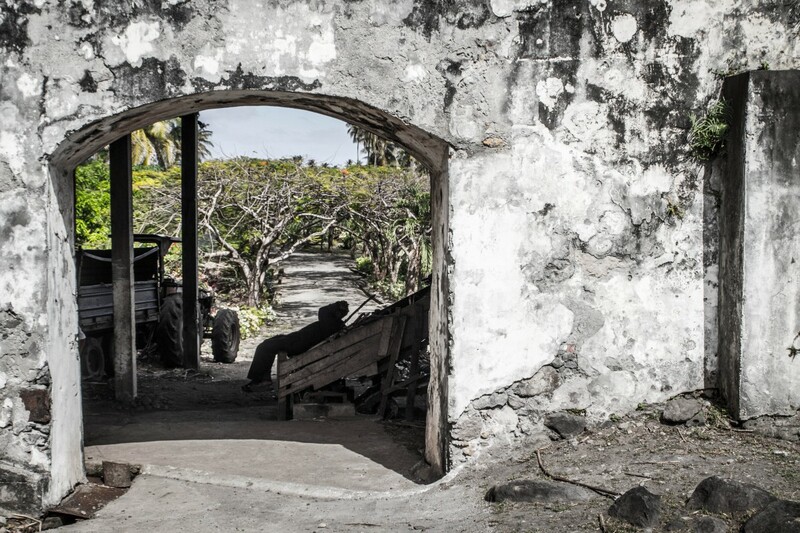 I love the pictures and story of the rum distillery. I’d love to visit one… so might as well book a trip ASAP. Love how your pics are in a collages. 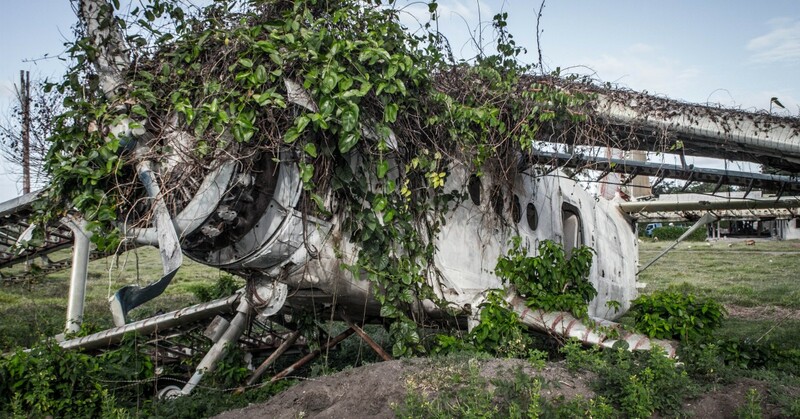 The plane graveyard looks like a place my boys would love. I love the photos. The distillery looks interesting and the photos are just great. I love the one of your child with the iguana! It’s fantastic. Wow! I love all the images. They really help tell the story (along with your excellent travel writing 🙂 I especially love the plane graveyard. Super cool! A small place that offers a rainbow of experiences! Wow! Thanks Rob! It really was like a step back in time. The place is the oldest spice factory on the island and they still do things in the same way as when it was originally built. And the smells. My God the scents are incredible! Gorgeous photos, the old Land Rover is a work of art! What a stunning place ! Your description combined with the stunning photos takes the reader right there! Beautiful post! 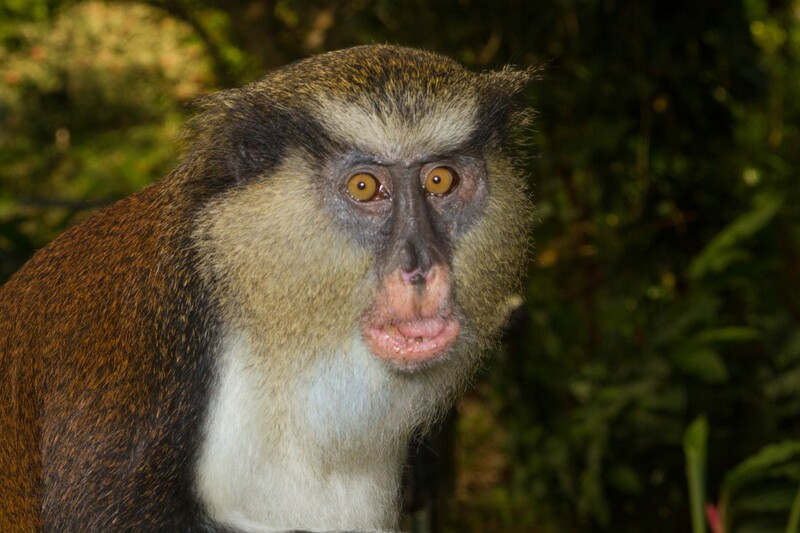 Lots of cool things listed here for my next trip to Grenada such as the plane boneyard and seeing those cute monkeys! I really enjoyed Grenada and the rum factories, spice tours, rain forests. Very unique island and a scuba diver’s paradise! Looks like the boys were having an awesome time! Kevin, you have a wonderful eye for photography. The contrast, the framing, the richness of each photo…all superb. You really captured what makes Grenada uniquely distinct from other islands. Thank you so much Renne! Grenada looks stunning, a real gem. Also, it seems to offer a range of interesting activities for travellers of all ages. Thank you for sharing this beautiful post. Grenada is the Caribbean as it used to be and is exactly why I’m drawn to it. Your photos are lovely as usual! Grenada comes across as a great place with so many varied experiences, I can see you had a great time. The encounter with the monkeys was indeed fun. I am sure you were initially shocked when the monkey landed on to your shoulder!